Our weekend begins with the opening night of of military music on the marble Maidan in front of the Royal Opera House. We need to be dressed and ready to go early as buses will depart the Al Bustan at 5pm and the Crowne Plaza at 5:30pm. We will be welcomed with a private reception hosted by the board of the Royal Opera House, HE Said Kamal Bin Fahd al Said, HE Dr Rawya Al Busadi, Minister of Higher Education UK Tr us from 6-7pm before the show begins with the Oman Royal Guard, the Royal Oman Police, Oman's Royal Army, Navy and Air Force, and the Combined Group of the Oman Royal Cavalry & Camel Band. Dress in full regalia as this is the moment to show ourselves off to the Omani great and good who wish to welcome us into their country with open arms. Oman, with a coastline stretching well over 3,000 kilometres from the Sea of Oman, the Arabian Sea and the Straits of Hormuz, is a sea-faring country, so we have chartered two dhows for a morning tour to experience Muscat’s coast through the eyes of ancient seafarers who plied this route for centuries. Therefore you can either have breakfast before or afterward (Al Bustan breakfast is served from 6:30—11:30am and Crowne Plaza from 6:00—11:30am) and meet in the lobby to catch shuttles departing from the Al Bustan at 7:45am and from the Crowne Plaza at 7:30am. If you’d like to swim, bring a towel and wear your swimsuit as we’ll stop for 20 minutes in an isolated cove to explore the coral reefs. Snorkels and masks will be provided and Arabian coffee, tea, and dates will be served on board. You’ll be back in your hotels by 10:30-11am. Those staying at the Crowne Plaza, gather in the lobby at 5pm to be picked up and brought to the Al Bustan at 5:30pm. For those at the Al Bustan, gather outside the doors to the Khajar restaurant on the ground floor at 5:30pm. After the sun goes down, at 5:45pm precisely, the pipes and drums of the Royal Army of Oman Band will strike up and lead each group in a full military procession toward the garden archway, where they will unite and march together toward the ball. 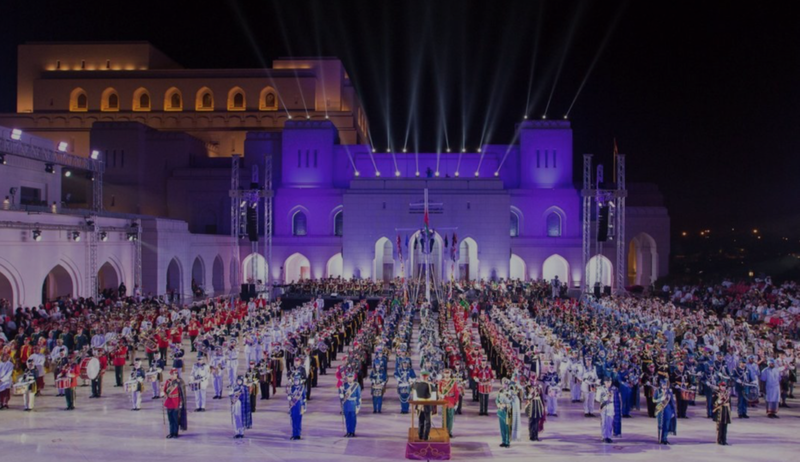 Enjoy dinner to the sound of the waves as the sun sets behind Al Hajar mountains, and be prepared for more musical celebrations from over 100 musicians and dancers from the Royal Army Band. Then, at 8pm, the Wayne Robertson Band will strike up and the The Muscat Desert Ball begins. Breakfast will be served at 11pm as we reel to the crashing waves of the sea through the night until 1am. Shuttles will return Crowne Plaza guests to their hotel at 1:30am. Wake up and enjoy an invigorating breakfast — both the Crowne Plaza and the Al Bustan have some of the best breakfasts in town. Enjoy the morning at the beach or pool, or for those who who want to do a little exploring we have three morning tours for the guests at the Al Bustan. Crowne Plaza guests read on, we have options for you, too. Claudia Junge, an ex-pat whom we have recruited to be part of our team, will be guiding intrepid walkers along the Muttrah Trail along with her husband Mike. This two hour hike is the ancient trekking route that was the gateway to Muscat. The route begins with stone slab steps that paved the way for hundreds of generations of visitors coming to Muscat. It offers spectacular views and is followed by a well deserved freshly squeezed fruit juice at the Souq. Bring money with you and prepare your bargaining skills for an hour in the Souq before catching the shuttle back to the Al Bustan at 12:45pm. For those wanting lunch, the Bait Al Luban restaurant is a 5 minute walk away. Departure from Al Bustan: 8:15am. Hike begins at 8:30am. Shuttle to the Al Bustan will be waiting in front of the Souq at 12:45pm. Level of difficulty: 2-3. Clothing: t-shirt, hiking shorts, hats, sunscreen and trainers or walking boots. For those at the Crowne Plaza wishing to join the hike, take a taxi at 8am to be at Riyam Park at 8:30am. Just let Claudia know you will be coming by writing her at: claudia.junge05@gmail.com. 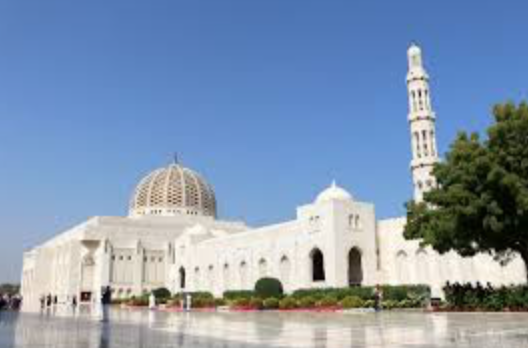 Maggie Jeans is organising a tour of the Sultan Qaboos Grand Mosque, home to the world's second largest carpet (45,208 feet) and second largest chandelier and occupies more than 4,447,000 square feet of glimmering marble. But most of all, this is a real place of worship with a warm, festive atmosphere. Afterward, Maggie will bring you to the palatial home of an Omani dignitary for late morning refreshments. Departure from Al Bustan: 8:30am. Expected return: Noon. Clothing: Shoes that are easy to slip off. Women please cover your shoulders, arms and legs and bring a scarf for your heads. Astrid will be accompanying this free-style tour of the National Museum, an impressive new building in the heart of Old Muscat which is the Sultanate's flagship cultural institution. It's a fitting consort to the Sultan's Palace which is across the way. There's time to nip into the Muttrah Souq in old Muttrah to stock up on frankincense and myrrh before grabbing a bite to eat at my favourite Muscat restaurant, the Bait Al Luban. Crowne Plaza guests, please be in the lobby of your hotel for an afternoon pick up at 3pm to be brought to the Al Bustan. For those at the Al Bustan, gather outside the doors to the restaurant on the ground floor at 4pm. At 4:15pm, men and women, dressed in their national costumes, will welcome us and we will proceed, Omani style, with drums and dance and singing, toward the seaside. Here, under the magnificent preparation of Saif Al Rawahi from the Royal Cavalry and Oman on Horseback, we will witness horses and camels racing across the sands in front of our eyes. 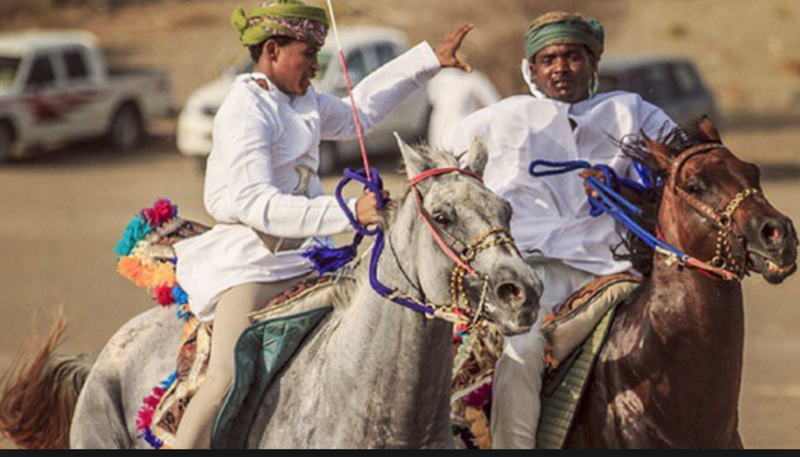 This display of Omani equestrian skill that needs to be experience to be believed. As the sun sets and the call to prayer at the local Al Bustan village mosque wafts on the evening breeze, Saif will organise his magnificent horses and camels to be brought before us for photographs and to ride. Then fires will be lit, as as we breathe in the smell of frankincense and enjoy rose water sprinkled upon us, our desert Ceilidh will begin. 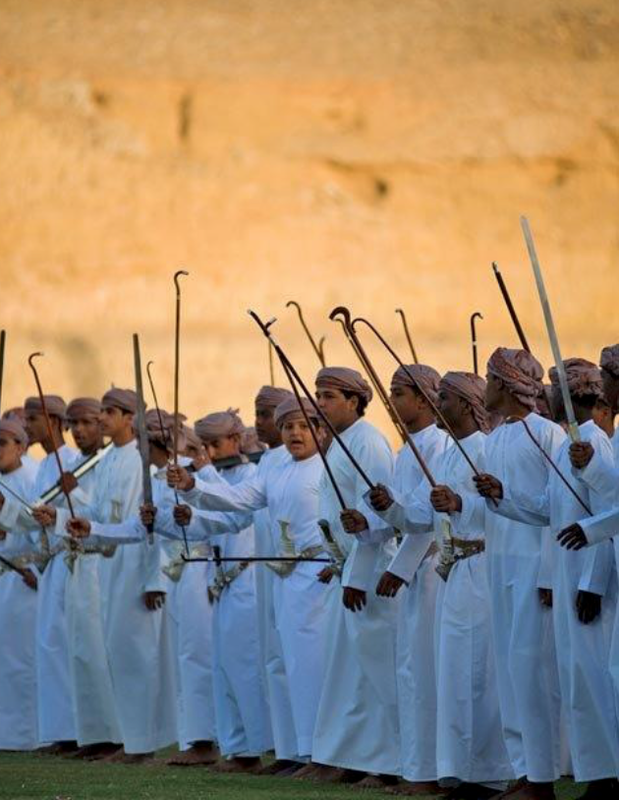 This evening will be a perfect way to feel the essence of Oman, which its chivalric spirit, strength, courage and generous hospitality associated with the Bedouins. Out of respect for Omani customs, we will not be serving alcohol so you may want to bring along something discreetly. The Wayne Robertson Band will be with us so after dinner wadi mats will be rolled out, Bedouin style, for a few reels under a starry sky. Dress comfortably, as you can wear turbans, kilts or both. There will be tents, shades, majilses in which to relax. It is a fitting end of a decade of grand highland balls around the world, celebrating the local traditions of other countries while celebrating our own. Then it will be time to return to your hotels, heads whirling with music and dancing that will fuse into unforgettable memories of a lifetime. After a hearty breakfast, those in the luxury class will be transferred to the airport, unless you are lucky enough to be continuing your journey with us—with all the information about that already in the itineraries that have been sent to you.